These pages describe a series of day rides on or near California's Coast. Calabasas, Topanga, Fernwood, Saddle Peak, Santa Monica, Venice Beach, Marina Del Rey, Playa Del Rey, Manhatten Beach, Hermosa Beach, and Redondo Beach in Los Angeles County. Utah is better known for its colorful canyon geography than its lofty summits. But it order to get to the summits, you have to traverse the canyons first. A cycling climb in Utah often involves a combination of arid canyons, mountains and forested plateaus. These pages derive from day rides or short tours taken over many years. They contain elevation profiles, pictures, route descriptions, maps and history for numerous summits. Some of these summits are part of popular touring routes, such as Ut12 connecting Capitol Reef and Bryce National Parks, or the Kokopelli's Trail near Moab. 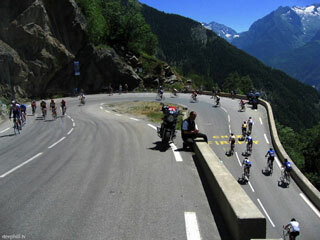 Many others see cyclists very seldom - includes paved and MTB summits - new summits added regularly. This is a description with lots of pictures of our August 2006 trip on tandem recumbent around Alsace with a few days in Bourgogne. We also did some traveling on the train, even with out very long bike. I also describe some of our planning work and how we built a box to take our 104-inch long bike on the airplanes from New York state to Mulhouse France. We camped part of the time and stayed in a great chambre d'hote (bed and breakfast) for several days. Ethiopia How can two sides of one village be so different? One hundred metres from Sudan and I had left behind Islam and North Africa and was into the continent's heart. The buildings, people and attitudes all felt different. The red dirt road was busy with pedestrians. Barefoot people and donkeys easily outnumbered the few fume-spewing, rattling vehicles. Women walked shaded beneath golf umbrellas, a strange sight in the African sun. Men bore a stout staff across their shoulders, their hands hooked over like wings. In Sudan the ladies flowed in colourful loose robes and men with bushy moustaches glided around in white galibayahs. In Ethiopia the men wore tight little shorts and tattered T-shirts, repaired many times, with a blanket draped over their willowy shoulders. Siberia We rode on and on through a frigid emptiness of low hills white with snow or black leafless woods. The white road ahead on the wooded hillsides stood out like a photo negative. The horizon's high mountains looked enticing and I felt happy to be here, to be at the ends of the earth with my bicycle. ``I'm out here a thousand miles from my home, walking a road other men have gone down. I'm seeing a world of people and things,'' sang Dylan in my headphones. Also check out the expedition advice. 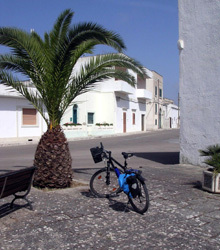 South of Tunisia: a interesting country to visit with a bicycle. Eine anspruchsvolle Radtour in 8 Tagesetappen über insgesamt 549 km durch das südliche Korsika, Tagesetappen zwischen 40 und 109 Kilometern. A demanding bicycle tour over 8 days and 450 kilometers through southern Corsica. The daily stages were between 40 and 109 kilometers. 15 giorni per andare dal centro della selvaggia Norvegia alle isole Lofoten, lungo la mitica rv17 con le nostre mountain bike cariche all'estremo. Un team per la prima volta formato da 6 persone, incontri e avventure tra traghetti e fiordi. 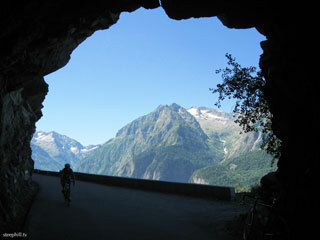 Photos and video of the more scenic and quiet backside ride up to Alpe d'Huez, Col de Sarenne, in the French Alps. The gap was bothering me. I had done San Francisco to San Diego and Astoria to Eureka. The ride from Eureka to San Francisco would take about a week. Which, coincidentally, was about all the vacation time I had after starting a new job. So I flew to San Francisco, took the bus to Eureka, and filled in the gap, on my first solo tour. I am a 37 year old GIS professional who decided that it was time to leave the big city of New York for awhile and explore places and cultures unknown to me. The website is mainly a blog about my travels (which I sometimes get behind in) and many photos, as well as pages showing basic maps, information about me and why I am doing the trip. Like any website mine experiences periodic problems so if there are no new photos or postings - there is usually a problem that I am trying to desperately fix at an internet cafe somewhere on the South American continent. We are 60 somethings, retired but inspired to ride our tandem around the world over the next five years. We rode out of Los Angeles, California September 2005 and proceeded south into Baja California, over by ferry to mainland Mexico. We have woven our way back and forth across the various countries as we have proceeded south. We plan to fly to New Zealand and Australia December 2006 and then after several months of exploration, begin to ride north through Asia. 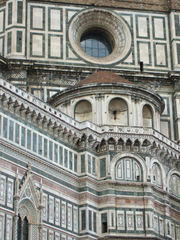 Our web site is a regularly updated journal with pictures. Visit us! 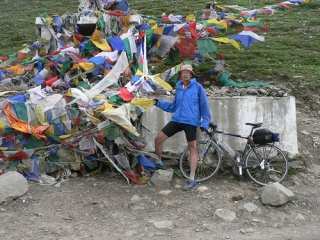 I've cycled over a number of passes these few weeks, but if I will remember one, then it will be Zoji La. It stands between Alpine-like valleys near Sonamarg and more rugged mountain ranges of upper Kashmir. 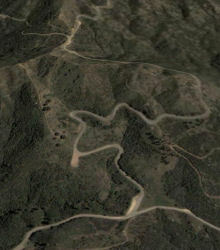 The road is cut into a steep mountain slope and it seems it's a one-way road. As a cyclist I was allowed to go in the wrong dirrection. Before that, going up to the summit, I had a sur-realistic encounter with incredible number of trucks (at least 200) that were descending the pass practicaly bumper-to-bumber. With dirt road and the headwind it ment cycling in constant dust and exhaust fumes. By the time all the trucks passed I was as white as a baker after a night's shift. My trip startet in Calgary and ended in Vancouver. I visited Banff and Jasper, passed Kamloops and spent some days at the famous mountainbike park in Whistler. Questa volta dobbiamo ringraziare la perseveranza e la volonta` di Pierangelo che ci ha spinti e motivati nell'affrontare questa avventura. Erano circa due anni che ci provava ed anche se non abbiamo fatto proprio quello che si era programmato all'inizio, siamo stati sul passo carrozzabile piu' alto del mondo (forse) ed abbiamo scorazzato per dieci giorni tra le montagne piu` alte del nostro globo. These pages describe a series of day rides in California's Central Coast. 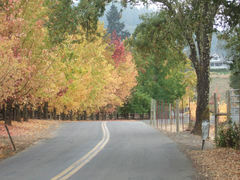 The rides include 17 Mile Ride, See Canyon, Figueroa Mountain, Camino Cielo and a loop of Lake Casitas. 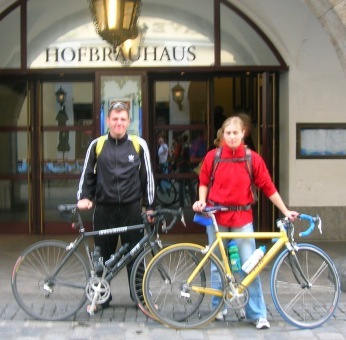 Why would I bike around America? Why not? Or better yet, because I can. After first reading about cross-country bicycle tours on Crazyguyonabike.com I was hooked! There it was, a great adventure that almost anyone could do, and I had all the free time in the world. Before reading about bike touring, I had dreams of hiking the 2500+ mile Appalachian Trail. But 75 mile days on a bike and real food quickly trumped 15 mile days on foot and oatmeal. So I sold all of my stuff, opted to not renew my apartment lease, and bought a bike. It took me three months and almost $2,000 to aquire the knowledge and equipment to pull off this trip, but now I am ready to start it. A lot of people ask me why I would want to do something like this. They either assume that I am either crazy, or poor. And while I may be a little of both, I just think it sounds like a good time. Cars, planes, and big cities are three things I try to avoid when I travel. So a nice slow bike ride through the Rocky Mountains sounds like a dream. While most people will spend $20,000 on a new car, or $5,000 on a one week vacation, I spent $2,000 on a three month vacation with no bills to worry about. Everything I need, will be carried with me on my bike.